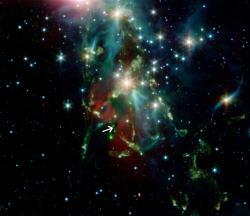 Magnetic Field Discovered - Universe Galaxies And Stars Section. Star forming region IRAS 4A. Image credit: NASA/JPL/CfA. Astronomers have finally discovered an object that has long been theorized: an hourglass-shaped magnetic field in a star forming region. The field is located in the protostellar system NGC IRAS 4A, which is located about 980 light-years from Earth in the constellation Perseus. Theorists predicted that the magnetic fields of collapsing clouds of gas and dust would form this hourglass shape because of the competing forces of magnetism and gravity. Long predicted by theory, the Smithsonian's Submillimeter Array has found the first conclusive evidence of an hourglass-shaped magnetic field in a star formation region. Measurements indicate that material in the interstellar cloud is dense enough to allow it to gravitationally collapse, warping the magnetic field in the process. Astronomers Josep Girart (Institute of Space Studies of Catalonia, Spanish National Research Council), Ramprasad Rao (Institute of astronomy and Astrophysics, Academia Sinica), and Dan Marrone (Harvard-Smithsonian Center for Astrophysics) studied the protostellar system designated NGC 1333 IRAS 4A. This system of two protostars is located approximately 980 light-years from Earth in the direction of the constellation Perseus. They reported their findings in the August 11 issue of the journal Science. NGC 1333 IRAS 4A is part of the Perseus molecular cloud complex - a collection of gas and dust holding as much mass as 130,000 suns. This region is actively forming stars. Its proximity to Earth and young age make the Perseus complex an ideal laboratory for studying star formation. Theorists predict that collapsing molecular cloud cores - the seeds of star formation - have to overcome the support provided by their magnetic field in order to form stars. In the process, the competition between gravity pulling inward and magnetic pressure pushing outward was expected to produce a warped, hourglass pattern to the magnetic field within these collapsed cores. Using the Array, Marrone and his colleagues observed dust emission from IRAS 4A. Because the magnetic field aligns the dust grains in the cloud core, the team could measure the magnetic field's geometry and estimate its strength by measuring the polarization of the dust emission. “With the special polarization capabilities of the SMA we see the shape of the field directly. This is the first textbook example of theoretically predicted magnetic structure,” said Rao. The data indicate that, in the case of IRAS 4A, magnetic pressure is more influential than turbulence in slowing star formation within the cloud core. The same likely is true for similar cloud cores elsewhere. Despite the moderating influence of the magnetic field, IRAS 4A is dense enough for gravitational collapse to continue. Approximately a million years in the future, two sunlike stars will shine where only a dust-cloaked cocoon lies today. The SMA is a collaborative project of the Smithsonian Astrophysical Observatory (SAO) and the Academia Sinica Institute of astronomy and Astrophysics (ASIAA) in Taiwan. It is located atop Mauna Kea in Hawaii.